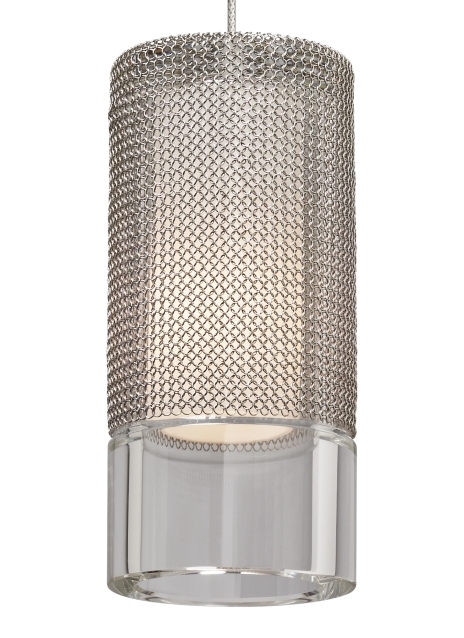 The Manchon Pendant light is incredibly dramatic featuring a perfectly cut crystal cylinder that’s been draped with Le Labo® chain maille from Paris. Light generously and inoffensively pours from this unique pendant through the inner glass diffuser. Due to its dramatic flair the Manchon Pendant can live in many space some of which include, bathrooms, kitchens, and dining rooms. To further enhance your lighting design, the Manchon can be paired with one of our multi-port canopies to create a customer chandelier, specifically designed for your space. Your choice of halogen lamping ships with the Manchon saving you both time and money. all lamping options are fully dimmable to create the desired ambiance in your special space.